– This is an ATP 500 match. – Jarkko Nieminen is 31 years old. David Goffin is…22. – This is Jarkko Nieminen we’re talking about. – Nieminen is ranked #56 in the world. – Goffin is known for playing well on fast surfaces. This was indoor hard. – Again, this is JARKKO NIEMINEN WE’RE TALKING ABOUT. Goffin suffering from some major Troicki demons today. It really seems like choking at two-sets and a break lead to Viktor Troicki is the worst thing you can do in your life. Why Davis Cup isn’t good for young players. Nearly beat Troicki 3-0. Chokes bad. Gets double bagel in next match. #Goffin. I gave Benneteau a tough time for being 0-7 against Nieminen and losing to him in a final. Getting double-bageled by TLKOTA is much worse. I can’t believe I’m about to get this wish granted. Janko too RT @juanjo_sports I’d like Stakhovsky to tweet an explanation for that double-bagel. Maybe not this one, though. We all want to know, BG. What the heck happened to Goffin? Somehow, a lot of people ask this question. Nobody ever asks this if a WTA player is the one receiving a double-bagel. How did Goffin lose 0 and 0 to Nieminen?Makes no sense.Maybe still hurting from Davis Cup?Not as if Jarko’s serve is unbreakable. 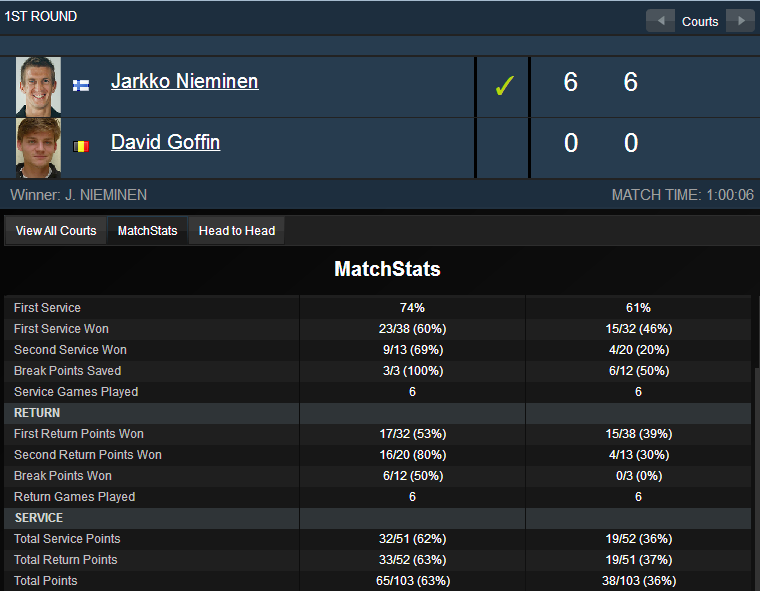 Wow Nieminen beats Goffin 60 60, despite being lower ranked than Goffin! !That is a bad day at the office!! That seems like an understatement. @juanjo_sports he’s young. It’s hormones. I like this theory. Dr. Jo-Willy Tsonga’s theory might apply. Nice cop-out, Stakhovsky! Whenever you go on your equal pay nonsense again, you’ll be swiftly referred to this page. You can thank David Goffin and Jarkko Nieminen for that. Having said all that,seeing some of the reaction on twitter, I am surprised nobody has suggested match fixing at this point. Has anyone ever double bagled a member of the top four in a tour match? lol Arya, but thats the brilliance of it. It was a such a demolition that nobody would believe it if it were fixed that way. Goffin is a good player. And Nieminen is… Nieminen. This really doesnt have any explanation other than David is incredibly tired or injured. A 6-0 6-0 score would normally suggest something nearer a 70/30 split (see, for example, Federer/Gaudio WTF Shanghai SF(!) 2004, won 55/25 by Federer). Since Nieminen won 65 points, he and Goffin must have been at deuce multiple times in the match. We know Goffin had 3 BPs: likely had 5 or 6 GPs on his own serve, and failed to convert any. I watched the match and it did seem like Goffin wasn’t really in it. He struggled with his own serves and made unforced errors especially in deciding points. I couldn’t help of thinking that he lost in purpose. Still, out of curiosity, I would really like to know what does “Goffin is a good player. And Nieminen is… Nieminen” mean? After, all, Nieminen is former top 20 player, and Goffin is… well… who? Do some of you guys actually get off disrespecting players like Jarkko Nieminen even if you’re miles (actually light years) away from holding a candle to him? Looking at his stats, he’s been in the top 100 for 12 years in a row (not many current players can say the same), been as high as #13. Was a match win away from being in the top 10 in his prime, and was then riddled with some tough injuries. Came back and was never the same. I still wouldn’t rate him as a journey man though. This year he’s won Haas(#21), Benneteau (#35) and Davydenko (#37), and took Gasquet (#10) to three sets last week, so it’s not like the man can’t play. About the match itself – saw part of it: Goffin probably had a bad day at the office (as James Wood suggested), was making unforced errors in plays where a pro should just put the ball away even in his sleep. Sure Nieminen is notorious for his 2nd serve, but he managed to mix things up and Goffin just didn’t have the answers on that given day. Nieminen just played the important points better. And speculating with Goffin’s possible injury or illness etc. is just belittling undeservedly Nieminen’s performance. I couldn’t believe my eyes when I found this site via Twitter. Seems to me that the guy(s) really do get their kicks this way. Shame on them. Verdasco survived the scare (of his life?) of having almost joined the notorious “Double bagled by Nieminen” -club. Imagine what kind of crap he would’ve gotten on this site had he done so. You guys were barking at the wrong tree.